A note to the IF crowd: I am drawing an original transformer every day this month, so I am trying to make the Friday ones line up with the IF theme. This week’s theme was a challenge to find an alt mode for but I think a copy machine works quite well. 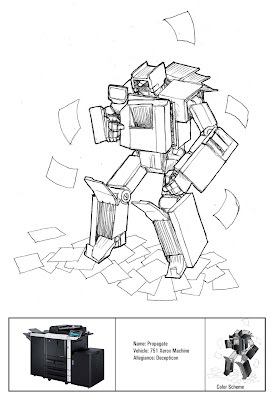 He is a Decepticon of course; as anyone who works with one of these infernal machine knows they are inherently evil. Love love love love love!!! Ooohhhh, how I love this one! Yes, certainly a Decepticon. I'm pretty sure I could hear the old Lanier copier in my office snicker evilly each time someone hollered "Kari, the copier won't..."
Perfect! ....and awesome! Love it. I laughed so much!!! Cannot wait until my Transformer loving son wakes up, so that I can show him!!! ~~and of course 'decpticon'!! !